I actually got two stitched over this past weekend. I'm stitching poinsettias right now, I plan to pick Santas next to stitch. 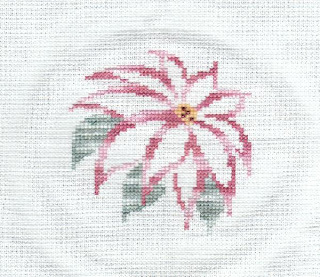 Anyway, this one is Poinsettia by Brittercup Designs and appeared in the 2007 JCS special issue. I changed the colorway to "brighten" it up just a bit, using Ozark Sampler flosses, and it's stitched on a plain white piece of linen (a real departure for me, LOL) that I found in my fabric tub.